AMCI's SD17040, SD17045, and SD17060 series stepper drives have been certified by Underwriters Laboratories® (UL) as UL Listed products in response to increased safety and performance requirements for machine builders and OEMs. The UL Listing mark on AMCI stepper drives indicates that the drives have been tested by UL to recognized safety standards. AMCI has expanded their selection of UL Listed stepper drives in response to increased safety and performance requirements for machine builders and OEMs. The SD17040, SD31045, and SD17060 series stepper drives are now certified by Underwriters Laboratories® (UL) as UL Listed products. The UL Listing mark on AMCI stepper drives indicates that the drives have been tested by UL to recognized safety standards. These newly approved drives are rated for operation in ambient temperatures ranging from 0°C to 50°C, and are compatible with AMCI’s complete line of motion controllers and high torque stepper motors. AMCI’s stepper drives provide a wide range of features including network connectivity, onboard indexers, encoder feedback, compact design, and simplified set-up. 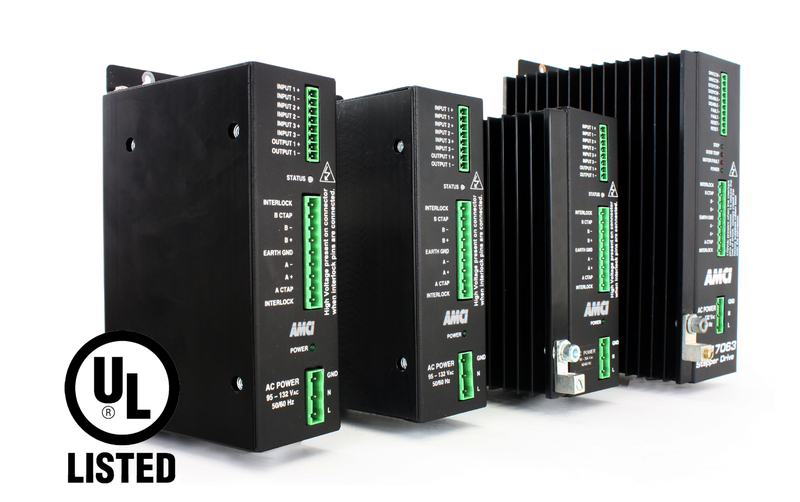 All of AMCI’s UL-Listed drives are self-contained with their own power supplies, and range from 4.0 Arms – 9.8 Arms (Amps RMS) of output current. Additionally, a high voltage version is now available from AMCI to meet European standards that require 230Vac input. All of the units can be installed into tight spaces without thermal issues, and offer panel or side mounting for increased flexibility. “Most machine builders and OEMs require UL approved control products because their equipment must meet safety and performance standards around the world. AMCI’s UL listed stepper drives achieve this level of excellence as verified by Underwriters Laboratories’ rigorous testing & certification”, explained Stan Mantchev, AMCI Engineer. Many stepper drives with UL approval are only recognized, whereas AMCI’s stepper drives are UL listed to ensure hassle free compliance in any installation. Underwriters Laboratories® (UL) is a company that has developed standards and testing systems to ensure products are safe. A UL Listing mark on a product is always composed of four elements including the UL in a circle mark (logo), and the word LISTED in capital letters. UL Listed products represent products that are found to be free from reasonably foreseeable risk of fire, electric shock, and related hazards, and that the product was manufactured under UL’s follow-up service program. AMCI designs and manufactures everything you need to easily configure a high performance, reliable stepper motor control system. Every product is designed for optimum performance when connected to other AMCI stepper products and will provide years of trouble free operation.